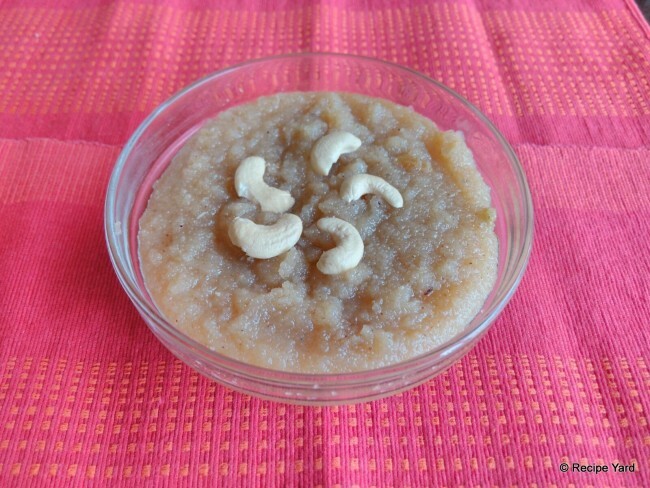 Sooji ka Halwa is a traditional sweet dessert that’s typically made on special occasions and festivals in India. It is a rich dessert with sooji roasted in ghee and ample sugar. Add in chopped dry fruits to make this dish a royal treat any day, any time. Place a wok over medium heat and pour the ghee in it. Once the ghee heats up carefully add the sooji and stir. Roast for a few seconds and then lower the heat. Cook the sooji in the ghee while stirring frequently until it is properly roasted to a golden brown color and starts leaving the ghee slightly. Meanwhile pour the water in a saucepan and place it over medium heat. Add the sugar in the water and stir. Let it come to a slight boil and then reduce the heat. Let the water and sugar syrup cook till the sugar dissolves completely. Stir occasionally. Turn off the heat when done. When the sooji is cooked, very carefully pour in the sugar syrup into it while stirring continuously. Tip: Stir continuously to avoid lump formation here. Once all the water has been poured in, cook the halwa while stirring occasionally until the water is completely absorbed into the sooji and it becomes almost triple its original volume. When the halwa starts separating from the ghee, turn off the heat and add the dry fruits. Stir, transfer to a serving dish and garnish with more dry fruits. Serve hot.